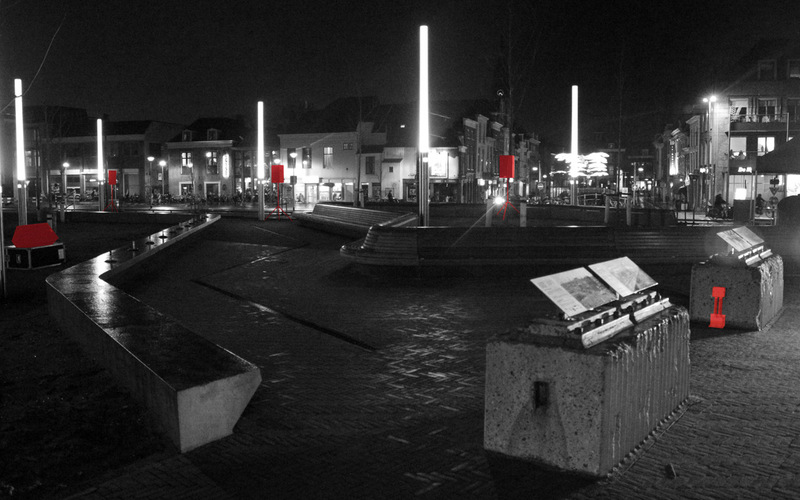 January 20, 2018 – Interactive sound installation in public space within the context of the unveiling of the Pijlermonument (Pillar Monument) at event in Spoorzone Delft ‘Van Spoor naar Stad’ (‘From Railway to City’). 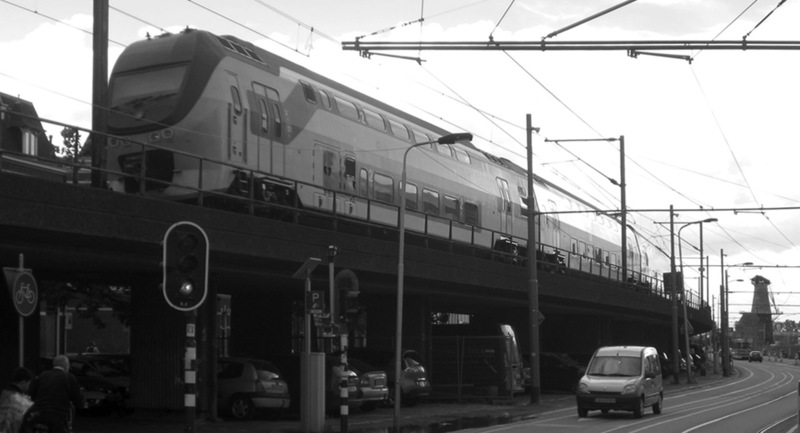 Resounding memories of trains passing by on the railway overpass through the city of Delft – of which two pillars were preserved as monument and the current pavement marks its position. 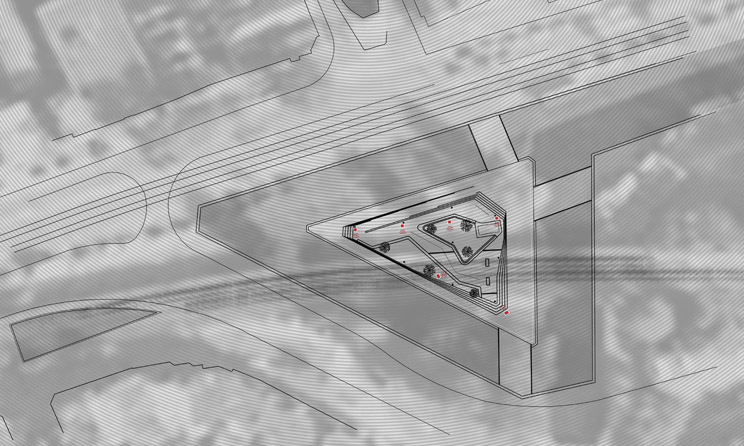 Between the two remaining pillars a motion sensor activated different railway sounds of that particular place, sounding through an arrangement of six loudspeakers (marked in red above) to reproduce the spatial experience. Sound installation by: Marcel Moerenhout, Donia Jourabchi and Taufan ter Weel (part of Hoorbare Herinneringen series). 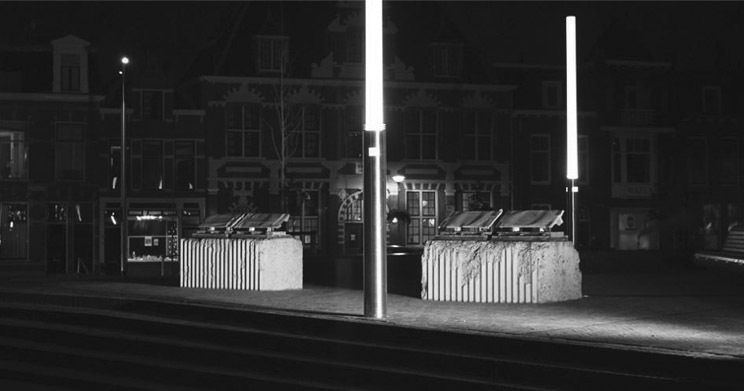 In collaboration with: Simon Huiberts (initiator – Pillar Monument), Alwin Snel and Tim Dumaij (production – De Burgemeesters). Commissioned by: De Burgemeesters, Gemeente Delft / OBS and Werkplaats Spoorzone Delft (WeSD). Special thanks to: Jitske Zitman & Astrid Keers (WeSD), Annika Hendriksen (Stadsarchief Delft). Marked in red from left to right: one of the speakers at low position, three (out of four) speakers on stand, motion sensor between pillars. 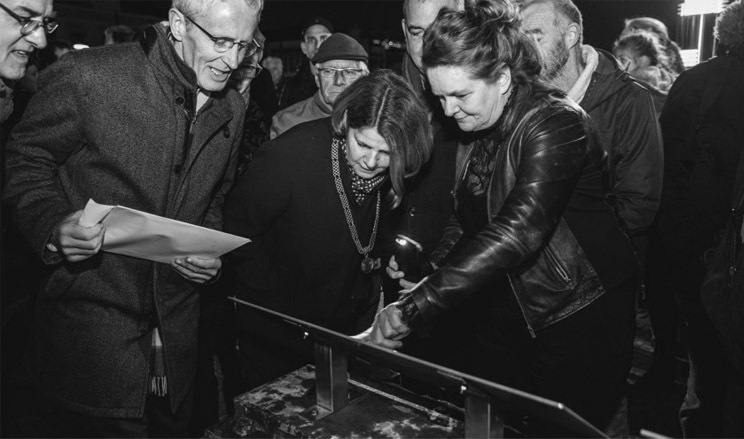 The unveiling of the monument (from Delftse Post – photo: De Burgemeesters). 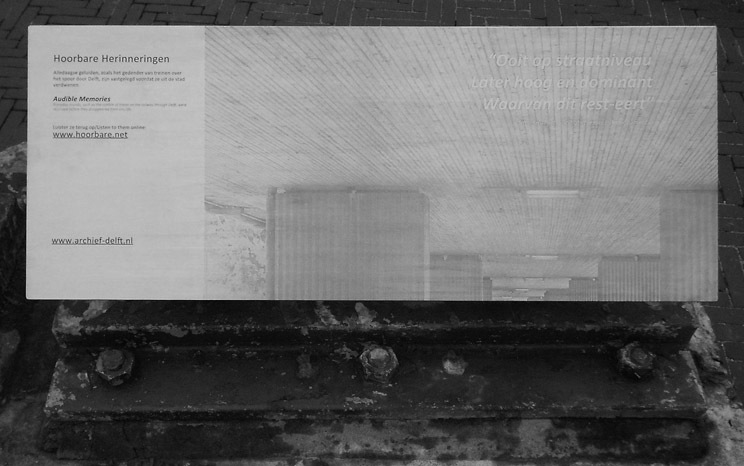 Audible Memories on monument – with link to sound archive (Stadarchief Delft), image of railway overpass before demolition, and haiku by initiator Simon Huiberts.